Last year I posted this image on my Facebook page. It’s a joke not all that different than the millions of posts we all scroll past daily. Several people liked it and I didn’t expect there would be much response. Then someone commented. 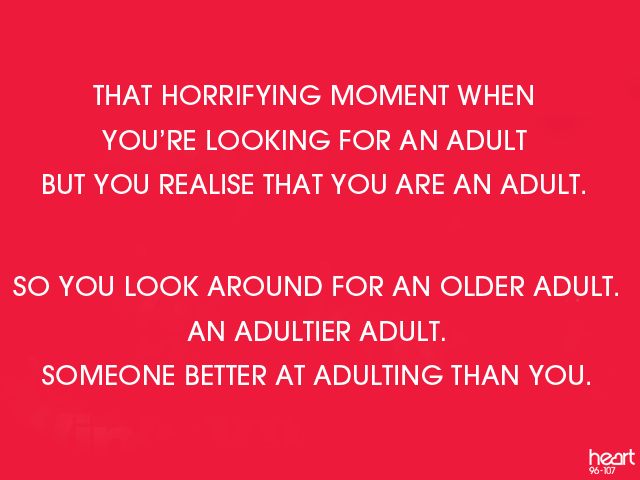 My dad’s best friend from high school said that he was still looking for that “adultier adult.” I reeled at the revelation that a highly successful man in his 60s would still struggle with not feeling adequate as an adult. Then my godmother shared the same sentiment. Now in her 80s, she was a mentor to my parents and is one of the most energetic, compassionate and faithful women I know. Who could possibly be better at adulting than her? These off-hand comments gave me a whole new understanding of what navigating adult life means. I got a glimpse of the inner life many adults have in feeling inadequately equipped to manage the expectations and transitions of adult life. As teens graduate and move into their 20s, they often feel under-prepared for the new adult expectations placed on them. Navigating taxes, insurance, credit, car buying, and home care can be treacherous, especially when many have never been taught how to deal with these expectations. Through social media, young adults now are talking more about their adult experiences and failures than ever before. So much so that we have turned working through these adult activities into the verb adulting. Nearly half of all young adults feel judged by older adults for their life choices. That judgment can be due to many factors, but it gives the church a beautiful opportunity to flip that script. We do so much to prepare children and teenagers for their future in academics and careers, but often we forget to teach them the more mundane ins and outs of being an adult. While this generation takes a lot of flak for postponing adult milestones, what many articulate is that adulting can be an intensely scary and lonely experience, even with the best of support systems. Older adults, please be honest and share your own struggles. Admit the times you have fallen short in your vocations as a family member, church member, and worker. This helps keep things in perspective for younger adults. Let them see you struggle with adult life and responsibilities, and show them how to navigate those struggles. Share your gifts and experience with them. Do you know a good tax person? Do you have suggestions on navigating the health care system? Do you have people who can replace headlights or investigate the bedroom door that keeps sticking? Do not underestimate the power of people walking alongside young adults as they make these first steps, and using it as a chance to share how Jesus Christ is with us through it all. Young adults, take heart. You will struggle to figure out how to manage your adult life, and especially to stay faithful to God in times of transition or stress. We are all both sinner and saint, and no one has it all figured out. It can be easy to believe that older adults have it all together, but the truth is that we are all learning as we are going. Don’t be afraid to ask for support and for help as you manage new responsibilities and expectations. Adulting can be hard but also rewarding. More importantly, the church can be a place of forgiveness and refuge as you seek support. Perhaps this is an opportunity for the church community to provide something for young adults that seems very superficial, but that truly makes an impact on their faith lives. Give young adults a safe, loving, and supportive place to come with their adult questions. Raise up people around young adults who will walk with them through cooking their first chicken or getting their first car loan. The church is uniquely qualified to offer a community of Christ-centered support that young adults are desperately looking for. In the search for that “adultier adult”, let’s take the opportunity to grow the whole Child of God.